Training, process development and decision implementation all in one package makes Prioritize Software the best solution for your resource allocation decisions. 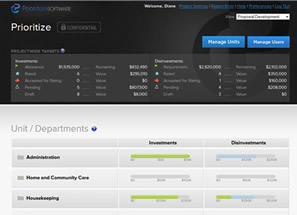 Prioritize Software simplifies the complex process of deciding how best to allocate a limited budget across existing and future programs. Our comprehensive, user-friendly, stand-alone package, will guide you and your organization through a priority setting and resource allocation process, from project conception to decision implementation and evaluation. Prioritize software allows you to specify security levels that suit your organization’s structure. This enables your organization to determine which areas of the project are accessible to which users allowing tight control over confidential information without hindering collaboration between managers, staff and clinicians. Track your organization’s progress with easy-to-use built-in features such as dashboards and report generation. Dashboards updated in real-time allow for quick assessment of your project’s progress, including a project snapshot all the way down to what’s happening at the department level. Reports can be generated and shared at any point in the process enabling the decision maker to obtain information at the click of a mouse. PBMA doesn’t just help balance your budget, it maximizes every dollar spent.